Times Square in New York is the most visited place of Manhattan. This square, also known as ‘The Crossroads of the World’, has dozens of bright LED screens and is full of odd characters. It’s the place in the city where most selfies are taken and a must-visit for tourists. Not so long ago Times Square wasn’t all that special, but during the nineties former Mayor Giuliani and Disney turned the square into the light and architectural spectacle it is today. Times Square can be an overwhelming place, so take your time to let it all sink in. Walk up the famous red stairs, sit down and have a good look around you. You’ll see a lot of people dressed up as Disney and other famous characters. These entertainers most likely want you to have your picture taken with them. Afterwards they’ll ask you for a tip. It’s customary to give them one or two dollars, but it isn’t mandatory. If their behaviour makes you feel uncomfortable, you can always address a police officer. You might also bump into the Naked Cowboy. This world famous guitarist wears nothing but a skimpy outfit and can be found regularly on Times Square. Summer or winter, and even when there’s a thick layer of snow, this cowboy entertains the crowd wearing nothing but briefs and a cowboy hat and boots. There are also many themed restaurants such as the Hard Rock Café, Bubba Gump and Planet Hollywood. Look up to see the famous ball that descends every year to announce the arrival of the new year. This ball drop ceremony can be witnessed during one of the many ball drop parties. In addition to the many souvenir shops, Times Square is home to many flagship stores of popular brands. These stores are sometimes an attraction in itself. There’s the M&M’s Store, selling the famous chocolate treat in every colour you can think of. The Disney Store, with two floors full to the brim with all things Disney (including a huge fairytale castle). And go to Hershey’s Chocolate World for, amongst other things, the ‘largest s’mores experience’. There are also some popular clothing brands that try their luck at grabbing attention on Times Square. Shop at the huge H&M or Gap, which recently set up home in the old Toy’s “R” Us location. Across the street you can find a branch of American Eagle Outfitters. They are all several times the size of any of their regular locations. As most of these stores are open until around midnight, Times Square is the place where ‘shop ’till you drop’ is a real possibility! 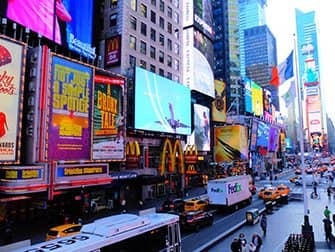 There are a number of museums on and around Times Square such as National Geographic Encounter, Madame Tussauds and Ripley’s Believe it or Not!. And for musical lovers, this is obviously the place to be. Around Times Square you can find as many as 40 theatres where Broadway musicals are performed every night. Not only great classics, but also the latest productions. If you’re looking for an hotel in New York and want to enjoy the hustle and bustle of Midtown Manhattan, you should definitely book one of the hotels around Times Square. You’ll be staying in the heart of the city, within walking distance of many attractions and several subway stations. In 2009 the largest part of Times Square was closed to motorized traffic and became a pedestrian zone. There are many different subway lines that can take you to Times Square. The purple, red and yellow lines all stop at Times Square / 42nd St. And if you take the blue line and get off at Port Authority, you’re only a few minutes away from the beating heart of Manhattan. Eric’s Tip: On your arrival day in New York, you’ll probably won’t have much time to go sightseeing and the chances are that you’re tired because of the jet lag. 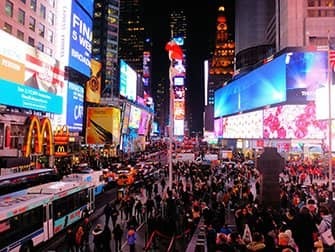 Taking a walk around Times Square and grabbing a bite to eat, at John’s Pizza for instance, is an excellent idea for your first night in the city.